Just as a ship captain needs a co-captain to help keep the ship on a steady path, the CEO also needs a co-captain to help navigate the murky waters of business and spot the opportunities and risks ahead. Often, the CEO relies on the CFO to be his or her right hand, but many CEOs feel their CFOs are not strategic enough. According to a new report from Chief Executive Network entitled “6 Steps to Develop a Strategic CFO”, there are several specific actions CFOs can take to better serve their CEOs. To download a complimentary copy of this report, click here. “Finance often is up to its ears in manual repetitive tasks that bog down the function,” says Sandy Cockrell, global leader and U.S. national managing partner of Deloitte’s CFO Program. These often urgent tasks can leave little room for the thinking and reflection necessary for a CFO to provide genuine business insights that drive positive organizational change. While most financial analysis is primarily confined to that which has already happened, to help the CEO, the CFO should be more forward thinking. In working with hundreds of CEOs and studying best practices at top-performing organizations, Chief Executive Network (CEN) has identified six imperatives—with specific action items—that can help transform your CFO into a forward-thinking strategic partner. Review these action items and more information on how to get your CFO thinking more strategically, by downloading this complimentary white paper. 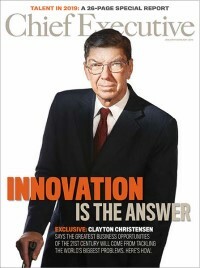 For more information about CEN’s peer network for CEOs, or the Senior Executive Network’s CFO peer network, please visit www.ChiefExecutiveNetwork.com.